In sworn statements provided for a lawsuit by homeowners against Bank of America, a half-dozen people who reviewed loan modification applications for BofA say the company encouraged staffers to lose applicants paperwork so that it could later be denied, putting homeowners at further risk of losing their homes. And if these people are to be believed, some folks out there may have lost their homes so that a BofA employee could get a Target gift card. The federal HAMP loan modification program was intended to give distressed homeowners an expedited process for finding out if they were eligible to reduce the amount they were paying on their home loans. But one of the through-lines seen in all the statements given by the former employees is a repeated allegation that Bank of America executives instructed employees to do whatever they could to slow down this process — and to do so by blaming the homeowner. And a loan origination officer from Dallas claims that Bank of America often had homeowners send their documents to third-party companies who would then place them into BofA’s computer system. But which system? 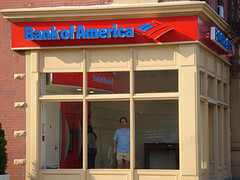 The team manager alleges that BofA’s goal in pushing for these delays and rejections — a program that he says came down from a Vice-President in charge of modifications for the entire eastern U.S. — was to ultimately not grant modifications to homeowners, but to push them into a Bank of America refinance that has a higher interest rate than HAMP mods provide. She claims that her bosses also pointed out the upside to lying to homeowners. After letting these documents sit around gathering dust for long enough to make them “stale” — about 60 days — the former team manager says he would be instructed to take part in a “blitz,” in which staffers would issue a mountain of rejections in a very short period of time. “During a blitz, a single team would decline between 600 and 1,500 modification files at a time for no reason other than the documents were more than 60 days old,” he states. To satisfy regulatory requirements, he says that BofA staffers were providing the Treasury Dept. with bogus information about the reason for denials. It’s easy to understand a bank’s financial motive for delaying and denying HAMP applications, but it surely must have taken a lot to get employees to deceive homeowners straight into foreclosure, right? Not exactly, according to at least two former BofA staffers. Those who did not meet quota were subject to termination, says the former staffer. Another former collections employee, this time from Texas, claims that people in her office were reward with “$25 cash, or a restaurant gift card” for meeting quotas on the number of HAMP accounts they could “close” — referring to homeowners whose applications were rejected. And for that $25 in cash, she alleges that staffers went to extreme ends. In addition to the one staffer’s claims that HAMP denials contained bogus justifications for rejection, other employees allege that BofA went even further in deceiving the federal government and the public. The loan origination officer from Texas questions BofA’s reports to the Treasury Dept. — and public statements about these reports — involving the huge volume of successful modifications it was providing to homeowners. For its part, Bank of America claims that these statements are “rife with factual inaccuracies,” though it does not cite what those inaccuracies might be. “We continue to demonstrate our commitment to assisting customers who are at risk of foreclosure and, at best, these attorneys are painting a false picture of the bank’s practices and the dedication of our employees,” reads a statement from BofA to Reuters. These statements — which can all be read in their entirety at ProPublica — are part of a lawsuit filed by homeowners who were granted a trial modification, made all of their payments, but whose applications were not processed in a timely manner. A consolidation of 29 separate lawsuits from around the country, it is currently seeking class-action status. Next Closing A Wendy’s? Kinda Sad. Tearing Down McDowell’s Of ‘Coming To America’? Noooo! Next Up: Closing A Wendy’s? Kinda Sad. Tearing Down McDowell’s Of ‘Coming To America’? Noooo!